Since the track opened in 1909, the now-famous wheel & wing logo has graced the official program, tickets, and other paraphernalia for the Indianapolis 500. In 1981 the Speedway began marketing the race in official capacity with a dedicated unique annual logo. This logo was printed on the ticket, the program cover, the official poster, on signage around the facility, on official USAC inspection decals, on television and print media, on credentials, pace car graphics, merchandise, apparel, patches, hats, and numerous other paraphernalia. We continue our look at these works of art, picking up with the 1990s. 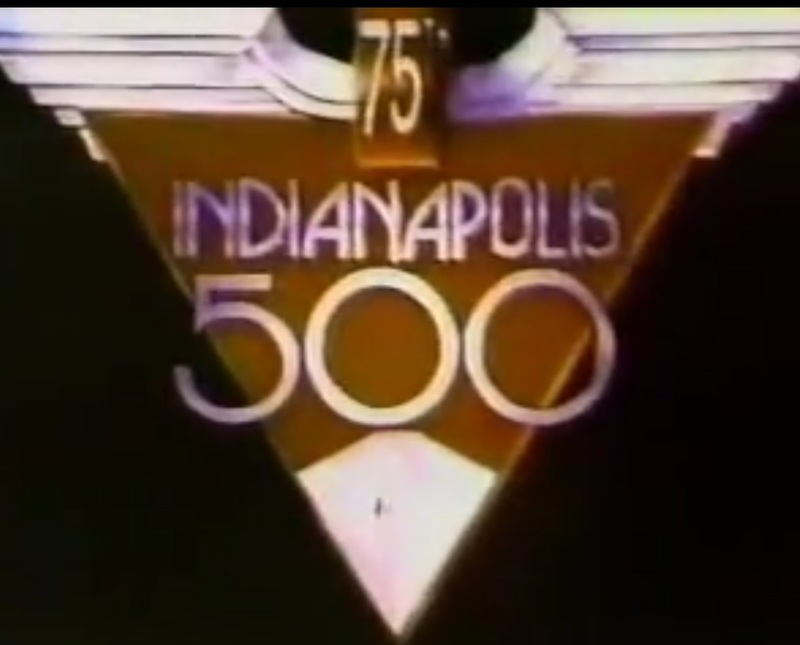 The race logo for 1990 continued the customary red/blue/white color scheme from the 1980s, and once again (like 1985) the wheel & wing logo was situated in the middle zero of the “500” with detailed feathers. Although for 1990, the blue appeared to be a darker version in nearly all versions. The ordinal was spelled out again, and a somewhat fancier, propriety font was used, keeping up the trend of a mixed-case “Indianapolis” rather than all-caps. On the pace car (Chevrolet Beretta), the logo appeared back on the front fenders in an all-black version. The much-anticipated and much-hyped 75th Running of the Indianapolis 500 in 1991 celebrated the “Diamond Jubilee” edition of the race. The race logo used a thin, elegant font (all-caps) and abstract version of the wing & wheel, all encapsulated in a diamond shape. A small diamond emblem at the bottom gave extra emphasis of the anniversary. The customary red/blue/white color scheme was used, and was conveniently embraced, as the 1991 race happened to occur in the months immediately following Operation Desert Storm. The month of May 1991 was replete with honors and accolades for the troops returning from the Persian Gulf. Though the original version of the logo was mostly transparent, a stylized version appeared on ABC-TV graphics and on the official highlight film which was filled with a red background and changed the lettering to a shiny chrome blue effect. On these two variations, the small banner with the date was removed. On the Dodge Viper pace car, the logo appeared on the fenders, but was difficult to see from much of a distance, as the red paint offered very little contract to the thinly-drawn logo. The 1992 logo was red/white/blue, with red as the prevailing color. Back for the first time since 1988 was the article “THE” preceding the ordinal (“SEVENTY SIXTH”). On the Cadillac Allante pace car, the logo was placed on the rear fenders, and was an outlined, all-silver version. On the Ford Mustang Cobra pace car, the logo decal moved to the rear fender, and was an all-white version. This provided adequate contrast on the red paint job, as opposed to the 1991 logo (see above). For the first time, the race logo sported different colors from the years before. A contemporary design of green, maroon, and, gray was used, with the race car silhouette this time simply an outline. The wing & wheel logo was depicted in an abstract form, with the wings as bars, and the wheel replaced with the numbers “500” in the middle. A stylized version of the logo appeared on television with the outline of the car filled in with a silver-gray shading, the green wings changed to blue, and all text removed. The colors of the logo and the 1995 Chevrolet corvette pace car were similar, and the logo decal was moved to the door. In the pace car interior, the logo was embroidered on the headrests. 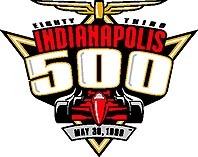 A colorful logo graced the 1996 Indianapolis 500, the first of the Indy Racing League era. For the first time, a race car was drawn, rather than silhouetted. The car was drawn along a round shape which resembled a track orbiting around the numbers “500.” The original version of the logo was depicted upright, with the letters and numbers slanted upwards. However, on the front fender of the pace car (Dodge Viper GTS) and in other instances, it was depicted tilted, with the “500” flat and the letters slanting forward. As the logos were beginning to become more elaborate as the 1990s progressed, the 1997 version was perhaps the most unique thus far. A shield that resembled a coat of arms made up the 1997 race logo, and the race car depicted matched the new IRL style chassis rolled out during the 1997 season. This was also the first logo to write the ordinal (“81st”) as a number since 1991. 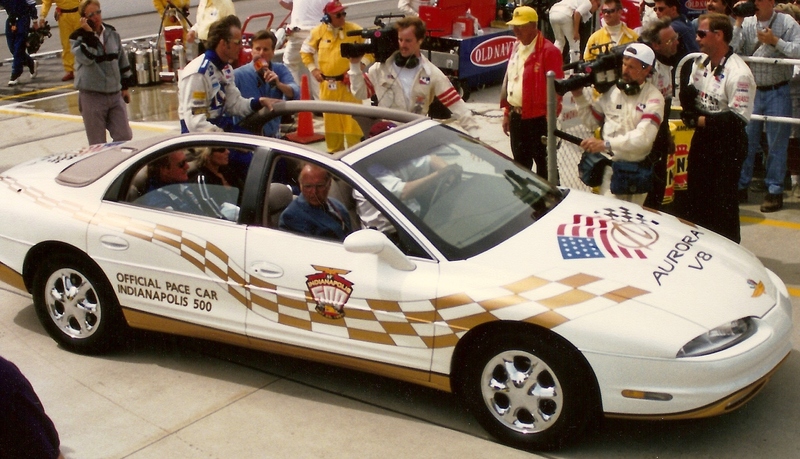 On the Oldsmobile Aurora pace car, a new trend began in 1997, mirroring a style from the 1982 pace car. A large, prominent logo decal was affixed to the driver and passenger side doors. Most pace cars going forward would feature a logo graphic similar to this style. The most-colorful logo of the 1990s came in 1998. The logo loosely matched the likewise yellow and purple Chevrolet Corvette pace car. Eschewing the trend that was set a year earlier, the logo was not placed on the side doors, but on the front fender, like numerous other pace cars from the late 1980s and early 1990s. The final logo of the 1990s was also perhaps the most “cartoonish.” The triangular shape loosely resembled the 1991 diamond logo. On the Chevrolet Monte Carlo pace car (a car replete with decal graphics), the logo’s lettering (“Indianapolis” and “500”) were placed on the doors, but without the rest of the logo. A smaller copy of the logo was placed on the front quarter panel, ahead of the front wheels.